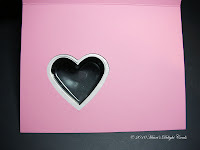 There have been a few requests for how to make the slider window in the Valentine's Treat Cup card seen on the blog hop, so here is the tutorial. 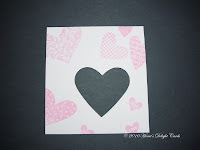 Punch the main focal point cardstock with the Full Heart Punch. 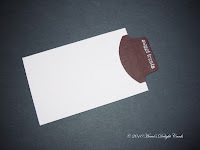 If you are using a mat under it, fasten the mat to the card front. 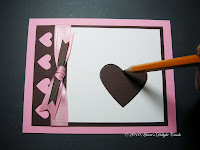 Position the punched cardstock on the mat/card front wherever you want it, and trace inside the heart. 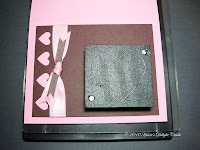 Follow the directions for using the Movers & Shapers Punch Window found HERE to make the opening in the card. 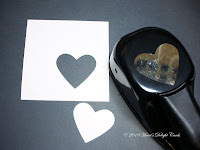 Stamp, emboss or decorate the main cardstock as desired. 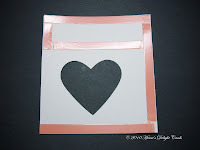 Apply sticky tape to the edges of the main cardstock as shown. Be sure to leave an opening for the slider, and don't remove the backing just yet. Don't remove the backing from the adhesive on the treat cup. 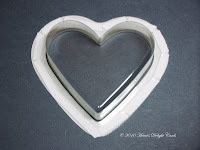 Using 1/8" sticky tape, adhere the Heart Treat Cup to the underside of the main cardstock. 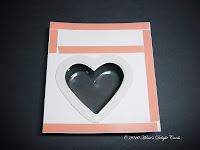 Now remove the backing from the sticky tape and adhere the main cardstock to the card front, making sure your hearts line up. It doesn't have to be exactly centered inside, as long as you can access the the cup from the inside to fill it. The slider itself is 2" x 3", with a Round Tab punched tab attached. 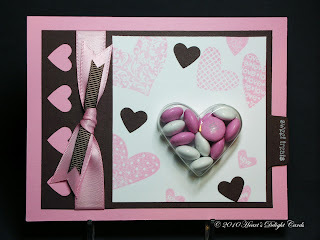 Start by sliding the candy cover between the main cardstock and the mat/card front. 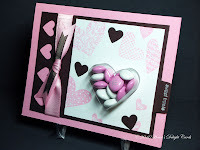 Open the card and add the candy, then slide the cover closed. Brilliant!!! Thanks for the tutorial! 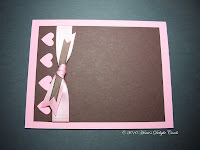 Very cute - love the punched border!! 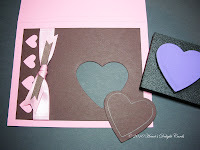 Love this card and thanks for the great instructions! One question - can you tell me the size of the white c/s that has the heart punch? Thanks you so much for the tutorial, Cindy! It's perfect, and your card is beautiful!! Thanks so much for sharing this tutorial! I just got the treat cups yesterday and have been wondering how to use them. This is very helpful! Great card! 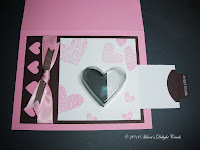 Great tutorial on such a pretty card! Where do you find those plastic treat cups? They were sold by Stampin' Up! back then. Sorry, I don't know where you can find them now!